My first day of the half term and I’m indoors drooling over online bargains, watching a very old glee and having cuddles with my beautiful doggy. It’s hard to pick some favourites of this wishlist, however I am loving the shorts. I really wanted some vintage-y shorts last Summer but never got round to getting some, and these are perfect and a massive steal. I’m really loving bomber jackets right now, I’m expecting them to be a big thing this Spring/Summer, I love the colour and pattern of this one I picked. 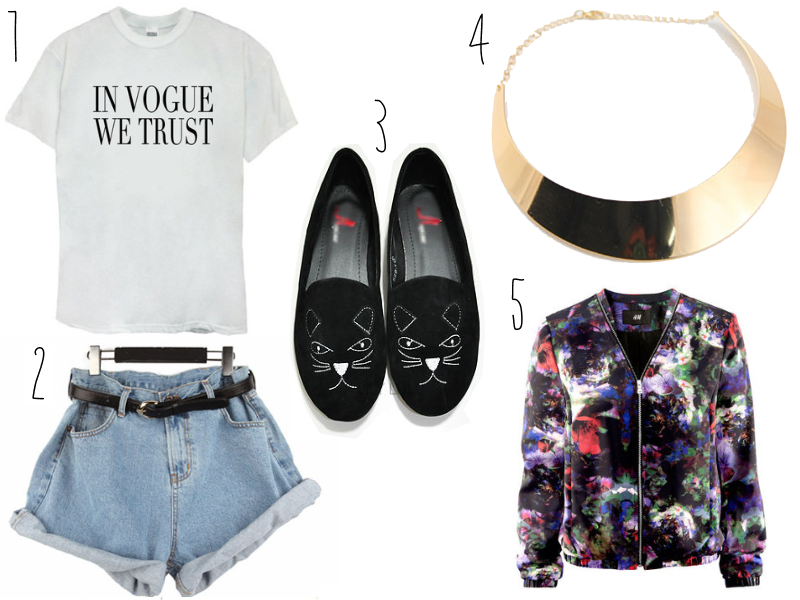 The shoes are just super cute, the tee is simple and stylish and the necklace is a perfect statement for any outfit. I’m hoping to actually get outdoors today and do something and make the most of my spare time before I knuckle down and start revising for my GCSE’s after the break! Totally not looking forward to that. I’ve also had a play around with my blog, the width, sidebar and header.. I think I’m finally happy with it! What do you think? "REVIEW: SOAP AND GLORY BROW PENCIL"